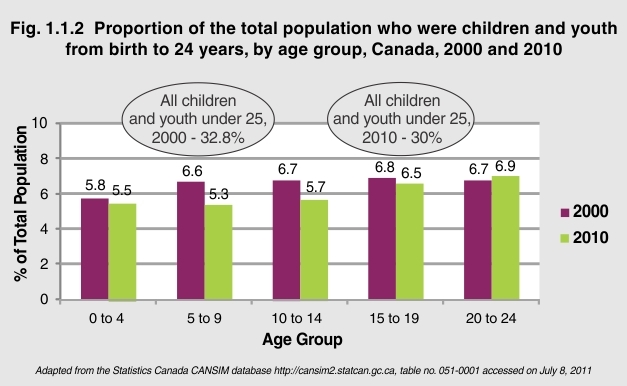 Although the actual number of children and youth in Canada increased from 2000 to 2010, they accounted for slightly less as a proportion of the total population – 30% in 2010 compared to 33% in 2000. In 2010, infants, toddlers and young children between the ages of birth and 14 years accounted for 16.5% of Canada’s overall population compared to 19.2% in 2000. As the proportion children of various age groups, as a total of the Canadian population fluctuates, appropriate shifts in resources and services will have to be made.